The Australian squad lifted the 2009 ICC Champions Trophy which was their consecutive triumph after grasping the 2006 one, under the captaincy of Ricky Ponting. The event was played between September 22 and October 5, 2009 in South Africa. A total of eight teams took part in the championship, including Australia, Pakistan, India, West Indies, New Zealand, England, Sri Lanka and the hosts, South Africa. Ricky Ponting led his squad from the front, he was announced ‘Player of the tournament’ for his excellent batting and captaincy. Ponting was the highest scorer while blasting 288 runs at an awesome average of 72.00 with 1 hundred and 2 fifties. Shane Watson followed him with 265 runs at a superb average of 88.33 with two centuries. Below, we will highlight the performance of the Kangaroos in the 2009 ICC Champions Trophy. The first match was played on September 26, 2009, at New Wanderers Stadium, Johannesburg. Australia – 8-275, Ricky Ponting 79, Mitchell Johnson 73*, Tim Paine 33, Nikita Miller 2-24, David Bernard 2-63. West Indies – 225 all out in 46.5 overs, Travis Dowlin 55, Andre Fletcher 54, Reifer 28, Nathan Hauritz 2-23, Shane Watson 2-34. Result – Australia won by 50 runs. The event took place on September 28, 2009 at SuperSport Park, Centurion. Australia – 4-234 in 42.3 overs, Michael Hussey 67, Ricky Ponting 65, Tim Paine 56, Ashish Nehra 1-38, Amit Mishra 1-45. Result – The match was abandoned because of heavy rain and ended up without any result while both teams shared one point each. The game was held on September 30, 2009, at SuperSport Park, Centurion. Pakistan – 6-205, Mohammad Yousuf 45, Kamran Akmal 44, Misbah-ul-Haq 41, Shane Watson 2-32, Mitchell Johnson 2-45. Australia – 8-206 in 50 overs, Michael Hussey 64, Ricky Ponting 32, Tim Paine 29, Saeed Ajmal 2-31, Mohammad Asif 2-34. 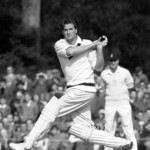 Result – Australia won by two wickets. The first semi final was played on October 2, 2009, at SuperSport Park, Centurion. England – 257 all out in 47.4 overs, Tim Bresnan 80, Luke Wright 48, Joe Denly 36, Peter Siddle 3-55, Brett Lee 2-46. Australia – 1-258 in 41.5 overs, Shane Watson 136*, Ricky Ponting 111*, Graham Onions 1-47. 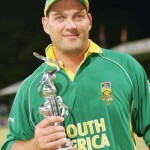 The supreme game of the tournament was played on October 5, 2009, at SuperSport Park, Centurion. New Zealand – 9-200, Martin Guptill 40, Neil Broom 37, James Franklin 33, Nathan Hauritz 3-37, Brett Lee 2-45. Australia – 4-206 in 45.2 overs, Shane Watson 105*, Cameron White 62, James Hopes 22*, Kyle Mills 3-27, Shane Bond 1-34. Result – Australia won the final by a huge margin of six wickets. The Australian side taking part in the 2013 ICC Champions Trophy is being led by Michael Clarke and anticipates registering a hat-trick by grabbing the coveted tournament. They will play their first game of the tournament on June 8, 2013, at Edgbaston, Birmingham, and will try to repeat the history of the previous two events. Michael Clarke (capt), George Bailey (vice-capt), David Warner, Shane Watson, Phil Hughes, Adam Voges, Mitchell Marsh, Matthew Wade, Glenn Maxwell, James Faulkner, Mitchell Johnson, Mitchell Starc, Clint McKay, Nathan Coulter-Nile, Xavier Doherty.